Carsharing has a brilliant, in many ways surprising and certainly very different future — a future which is already well in process. Carsharing is one of the fastest growing new mobility modes, with until now almost all services occurring in the high income countries. But it is by and large new, unfamiliar and does not fit well with the more traditional planning and policy structures at the level of the city. This is a problem. And addressing this problem is the goal of this cycle of reports and events in the year ahead. But that is not the end of it. Our research shows, surprisingly, that carsharing, one way or another, is an INDISPENSABLE element of any city’s sustainable transport strategy. That said, there are many different ways to get there. And that is what this program is all about. This is not a problem — it is an opportunity to be seized. • First, carsharing is the most visible part of a broader pattern which many cities are already witnessing — a new wave of different ways of owning and using cars. • Second, it is — though never a major mode in itself — a key part of a much larger new pattern, which by its presence enforces more and better public transportation and other more efficient, economic and equitable mobility modes for all in the city. • Third, it is a mobility arrangement that in fact lends itself not only to the richest countries on the planet but to cities in many parts of the world. Albeit with many variations and adaptations. • And finally, despite its fast rise the fact is that few cities have thus far worked out a coherent and consistent policy and planning framework for carsharing — which While there are a huge number of reports and publications charting carsharing developments and possible futures (we in fact have done many ourselves over the last decade) there is little available that can be directly useful to city government for their specific decision , planning and policy purposes. The bottom line is that our mayors and local governments need to know more about this new way of getting around in the city. This program of the New Mobility Agenda and World Streets intends to open up the topic in a series of steps in the year ahead, which can help the city leaders to take well advised decisions as to whether, and then how, to prepare for carsharing projects that are part of their new solution to the transportation challenges of their city. Addressing the one question: Should your city be looking into carsharing as an important, affordably and necessary new mobility option? Why? Why not? And what next? Length: approx. 100 pages +/- 10. Price: € 89.50 for e-book. €99.50 for both e-book and print book. We have co-organized carsharing workshops in more than two dozen cities across Europe, N. American and Asia, and we have seen how useful these can be in mobilizing interest and support for better carsharing in the host city or country. This project got underway in November 2013 under the leadership of the KpVV: (Kennisplatform Verkeer en Vervoer –Knowledge Platform for Mobility and Transport) of the Dutch government as a joint project with the support of Ecoplan and the New Mobility Agenda. The project intent is to support local and regional authorities in their efforts to develop and implement mobility and transport policy by providing practical know-how, developing reports and guidelines, arranging meetings, and setting up networks. To this end, the project team is meeting with and gathering the reactions and counsel of a cross-section of city representatives concerning ways in which national government could be useful in creating a more conducive environment to encourage and support more and better carsharing, as part of the overall New Mobility package of services. New Mobility Agenda: The program introduced in these pages is part of a long-term collaborative networking effort launched in 1988 under the heading of the New Mobility Agenda, dedicated to the search for sustainable transport, sustainable cities and sustainable lives. This long term project has been advanced year by year by a steadily expanding series of discussions, fora, events, communications and reports which have grown to involve thousands of people and hundreds of groups, agencies and cities, participating in different ways from more than 150 countries. In support of all this the messenger is the collaborative international journal “World Streets: The Politics of Transport in Cities” at http://worldstreets.org.&nbsp; And if you look to the column on the upper left of the opening page you will see that extensive collection of projects, programs and media which have been launched and are taking place as part of this long term process. Future of the Car in the City: The present project focuses specially on the field of carsharing policy and planning, in part in itself as an important sustainability tool for cities. Carsharing is one of the fastest growing forms of new mobility, and while of interest in itself to be fully understood it needs to be examined and understood as one part of a broader and really more important sustainability transition in progress, namely New Ways of Owning and Using Cars in Cities. Is carsharing a “detail”? Carsharing per se is not going to solve all the mobility needs of a city, but they can certainly be an important part of the solution. We call it a percent solution”, which may give the impression that it is not important. Wrong! All the necessary measure will each individually satisfy only a portion of the city’s mobility requirements, but what happens is that in a well-formed program they interact and reinforce each other. And the reinforcing role of carsharing is very important indeed. Carsharing Lessons: The present program responds to one of the most salient lessons that has come out of our long term efforts program, the World Carshare Consortium which has since 1997 brought together hundreds of people and organizations variously involved in and curious about the topic, starting with the first international meeting we organized on the topic at the OECD in September 1998. This “salient lesson” that has come out of our hundreds of projects, events and reports is that while carsharing today indeed extends to thousands of cities and commies across the globe, that by and large most cities have no coherent carefully thought though policy or program frame for the sector. This project is thus targeting local government and their elected representatives, and their technical staffs, to see if we can in this way help spark more and better carsharing programs in cities around the globe. Why so important? Well, carsharing is a valuable tool for sustainable transport and sustainable cities — that much is clear. But beyond that carsharing by its very nature brings to the attention of local government a whole tissue of issues and possibilities which in most cities are not yet getting sufficient attention. Thus, you cannot expect to have a well-working carsharing project making its full contribution to its city, unless you have also grappled with important and usually difficult parts of transportation policy and practice, such as parking, links between carsharing and public transport, speed, cycling, pedestrian policy and overall transportation economics. Smart carsharing demands a good thought-out synthesis of the rest of the system, and that is perhaps among its most important single contribution. World Carshare is an informal shared public interest knowledge building network and shared resource created in 1997 under the New Mobility Agenda to serve carshare operators worldwide, potential start-ups, policy makers, local government partners, researchers, public interest groups, cooperating transporters, the auto and rental industries, concerned citizens, and others interested both to learn more about carsharing and how it works, as well as latest developments in the field internationally. This free, cooperative, independent, international, networking program supports carsharing projects and programs, worldwide. It offers a convenient place on the web to gather and share information and independent views on projects and approaches, past, present and planned future, freely and easily available to all comers. 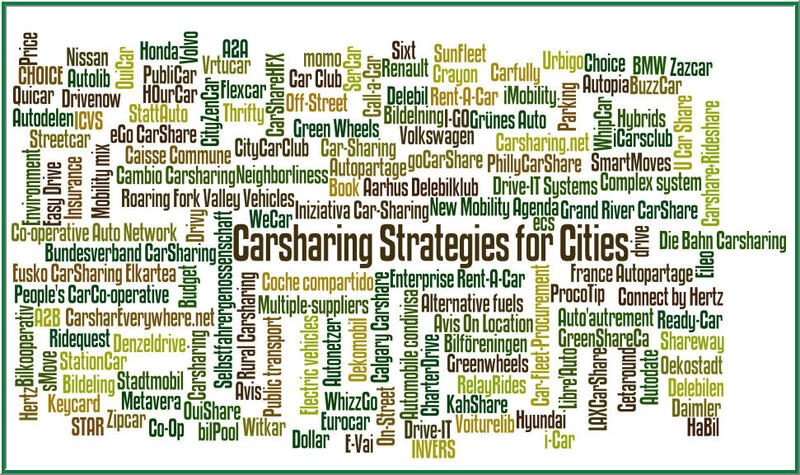 Since 1998 we have organized and lead conferences and workshops on carsharing and carshare strategies in cities on most continents (except to our regret Africa), including: Eindhoven, Paris, Tallinn, Utrecht, Chicago, Penang, Washington DC, Stuttgart, Strasburg, Liverpool, Shanghai, Beijing, Jiaozuo, Kaohsiung, Amsterdam, Tainan, Taipei, Brussels, Helsinki, Guadalajara, Lyon, Barcelona, Seville, Lisbon, Faro, and others. (Full information on these events available upon request). This entry was posted in 2014, Cars, Carsharing, Collaborative project, Going Dutch, Governance and tagged * Sharing, *Shared/Mobility, 2014, CarFreeStrategies, Carsharing, City cycling, Governance, Paratransit, Policy, TSM, xCars. Bookmark the permalink. WRT your “vol. 1” effort, do you think that there needs to be better targeting by type of city based on whatever criteria, rather than a general volume? I only know what I know based on the US and Canada, and typically car share operates only in the largest cities. The major difference is between one-way and two-way systems, whether or not the systems are for profit or nonprofit, how the locality treats licensing and allocation of dedicated spaces–as a revenue generating function or as a way to support reduced car ownership and sustainable transportation/New Mobility. E.g., Hoboken, NJ or Arlington County Virginia are more focused on car sharing as an element of sustainable mobility and reducing car ownership (for Hoboken it is also an element of managing scarce on-street parking inventory), while Washington, DC is torn between generating revenue for the use of street parking spaces by car sharing services and encouraging sustainable mobility. In other words, I wouldn’t know what to recommend for cities that aren’t large and in first world nations. Are there structural differences between these cities and others that shape the opportunity for carshare and concomitantly the recommendations that should be made and the specifics of programs?